Synthesizing text can also be referred to as paraphrasing the text. When the reader paraphrases, they are writing the ideas of the author, but in their own words. For example, an author might write the following: “On a beautiful summer night, James sat upon his roof looking up at the night sky, admiring the stars. A soft breeze blew by carrying with it a sense of calm he would not soon forget.” A reader who is paraphrasing this text may write something along the lines of: “James sat on his roof and looked at the stars.” This is a correct statement in which the author’s intention is stated, but not in the same way. Synthesizing often detracts from the full meaning an author conveys, but is useful for short descriptions. 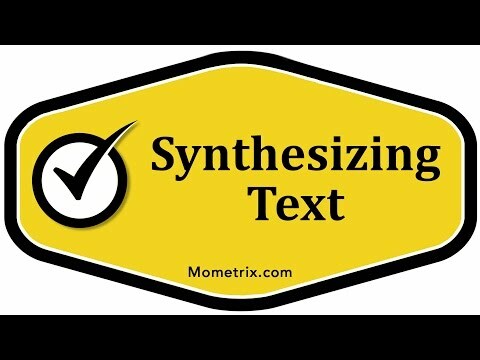 In some circumstances, it’s important to be able to synthesize text. We’re going to read this story and then we’re going to work on synthesizing, or paraphrasing, it. We’ll get to that in a minute, but first, let’s read this story. Now we want to paraphrase this, which means stating the author’s ideas in the reader’s own words. What we’re doing here is kind of like a summary. In fact, you may have already thought, “Oh, that sounds just like summarizing,” but it’s a little bit different, because a summary typically involves including the main points of a longer text, such as a novel or a full story. While this is not a full story, it’s definitely not a novel. It’s just a couple of sentences. When you paraphrase, you’re taking a couple of sentences or an entire paragraph and you’re including the main point of the text being reviewed, because that’s what the reader needs to know about the text. In our example, the reader needs to know that Emmanuel went swimming in the lake, but not more than six feet out. Those are the important points. It’s not really important the reader understands that the water reaches a depth of 20 feet. We want to focus on the main points here to summarize it. In other words, just take a couple of sentences and state it in our own words. In this case, a good paraphrase would be “Emmanuel went swimming six feet out in the lake by his house.” That’s a paraphrase of our example. We’re just stating the main points to those points and expressing them in our own words. This right here incorporates the main points that the audience needs to know.